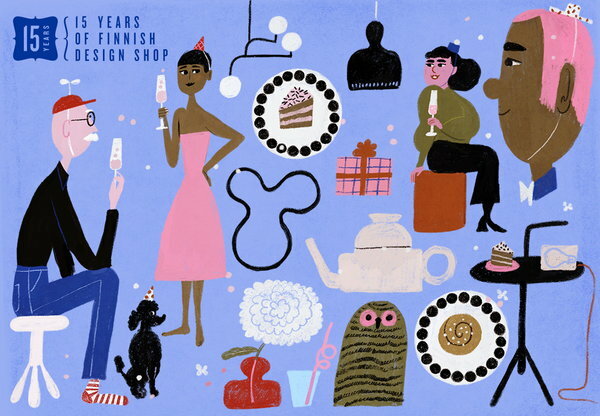 FINNISH DESIGN SHOP TURNS 15 THIS YEAR! To celebrate, we will organise exciting product launches and events including the FDS Award design competition. What makes a person happy? If you really want to know, ask someone living in the Nordic countries. After all, we’re the happiest people in the world – and we have studies to back that up*. So go ahead: ask. “What makes us happy?” Well, of course there’s Nordic equality, education, clean environment, nature and security – but, above all, the place we call home. For us, the home is a special place. As you know the weather here doesn’t always favor sitting around in a piazza, and this has made us experts on homes and cozy living – ever heard of hygge, mys or sauna? We don’t like materialism, but love aesthetics. We see less as more, and so everything, however small, should be chosen with care. Quality is not elitism, but sustainability. It’s products like this we have selected in the world’s largest Nordic online design store. Here, you’ll find all the major designers, brands and design classics, but also interesting new products that suit the Nordic style. Come in and find your own piece of Nordic happiness. Finnish design is known for its functionality and simplicity. However, finding Finnish design abroad hasn’t always been that simple. That’s why in 2004 we came up with an idea of an online store, which would sell big and small Finnish design goods all around the world. We also had a simple and functional name in mind: Finnish Design Shop. From day one, the products needed to meet two requirements: excellent design and top notch quality. Even though back then online shopping wasn’t exactly mainstream, fans of Finnish design were quick to find our store. In the beginning, we operated from a space the size of a small studio, where packing and distribution also took place. After a few years, products from all over Scandinavia were added to the selection based on customer demand. High quality and excellent design were still held on to. We also kept the name, Finnish Design Shop, since our warehouse and offices are located in Finland. As our selection broadened, new design lovers found our store and helped us grow into the world’s largest online store specialized in Nordic design. Our founder and CEO since the beginning, Teemu Kiiski, is still in charge of our business. Nowadays we are also part of A-lehdet Group with A-lehdet media house, which has inspired us to publish Design Stories – our very own online magazine. Today we have loyal customers in over 100 countries and counting. We have grown into a team of over 60 employees, which means that our CEO doesn’t have to spend his time packing deliveries anymore. Except maybe during Christmas when it gets busy.